Twice now on our way to Pearson International Airport in Toronto we've passed two Skystreams in operation at a shopping center. They've both been operating both times. That's plus, we need a lot more operating turbines in the Greater Toronto Area. This winter I've had the opportunity to come across several Skystream installations, one in my home town of Alexandria, Indiana. The first installations were at a shopping centre in Waterloo, Ontario. 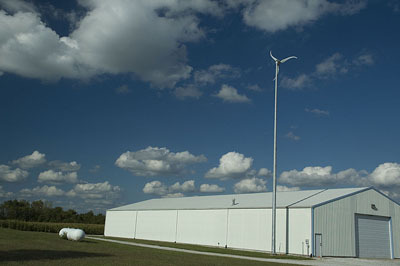 Two turbines were installed alongside the building. They were not attached to the building and were separate from the building structure. It was very windy and of the two, one was running. The second installation was in Toronto, Ontario. On the way to the airport we passed WindShare's Lagerway at ExPlace. It was in operation. Later on the route to the airport we saw two Skystreams alongside a shopping center. This was similar to the installation in Waterloo. Neither turbine was operating. The turbines may have been recently installed an not fully operation. There may also have been insufficient wind at the site a kilometer or two from the shore of Lake Ontario, or the towers were too short to catch the winds that the Lagerway turbine found useful. The installation in Alexandria, Indiana is on what looks like a 60-foot cantilevered monopole on the edge of town. The turbine is about 50-100 yards from a woodlot of trees about the same height. On December 21, 22, and 23 the turbine was operating in very high winds for central Indiana. It was following the wind well and didn't precess the entire time I observed the turbine. This was a common problem of downwind designs from the 70s and 80s. There was little blade flap, another common problem of downwind designs and the turbine was running well by my estimation. There was quite a bit of generator whine from the tower, but I took this a good sign and didn't find it objectionable. All in all the turbine is running well, looks attractive, and has fast become an object on the edge of this Midwestern small town. The turbine is also a reliable indicator of the wind direction, useful for those of us who like to know these things.